I’m not a traditional fan of old movies, but this is by far the best old film I’ve ever seen. Period. There is nothing dated about this 1927 film. This is one of those movies that is like an experience. I can’t believe how such quality was put into this film – the acting, the directing, the story, the editing, the special effects, the sets, and the cinematography. SUNRISE had me in tears by the end of the film. Besides this film being a totally moving and touching film, it’s heart-beating intense from beginning to end – I’ve never experienced that with old films, even with Chaplin, Keaton, or Lloyd films. After watching and loving CITY GIRL and now SUNRISE, I will definitely buy any other F.W. Murnau movie that gets released on blu-ray. This director is amazing! It’s really so sad that 4 DEVILS is lost, since that looked like a really good movie. 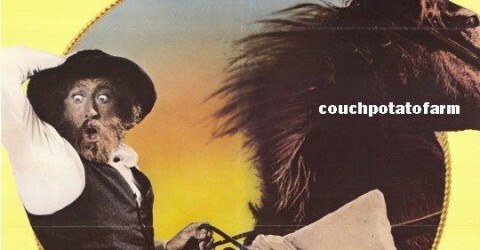 I wonder if there are Indiana Jones-type film historians that aggresively search for long-lost films. If a Czech copy of SUNRISE can be found, then there must be somewhere in the world that has the film reels or copies of 4 DEVILS. changed, but I flipped through some scenes and the video quality is better on that version. But it’s known that the Movietone version is the one we are allsupposed to watch to judge SUNRISE as a film. The audio is perfect – well mixed, fresh, and not hissy. The audio to this film is really intense by the way. The included extras are an audio commentary, outtakes, a 40-minute documentary about the lost Murnau film 4 DEVILS, an original theatrical trailer, an original ‘photoplay’ script, and a 20-page booklet. 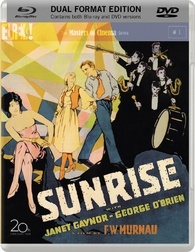 SUNRISE is a movie in constant motion – it just flows from beginning to end – the way this movie is pieced together is an example of how a movie should flow. If you love perfect movies, then buy this blu-ray.